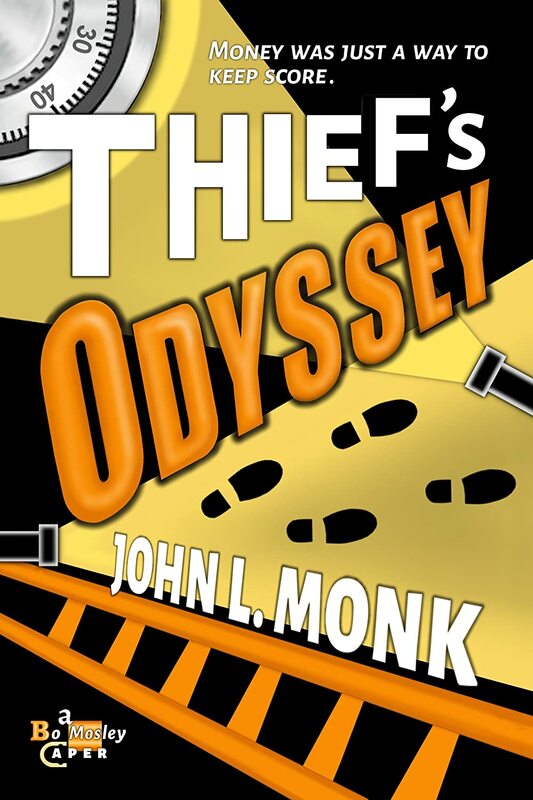 New cover for Thief’s Odyssey is now live! So after some soul-searching, I decided to go with a new cover for Thief’s Odyssey. This one is a little more in keeping with other books in the genre, and the thumbnail is more readable, which is important when folks are browsing through Amazon looking f or something to read. I also like the way the letters sort of pop out at you. That said, I love my old artwork to death and am sad to make the change. The previous artist did exactly what I’d asked and hoped for. Quick note about the new cover: I’m told by a friend that it shows up when you open the book, but the old cover still appears on your carousel/bookshelf. Clearly the image hasn’t percolated everywhere to all the various servers. Also, the new cover won’t appear if you purchased the old book. Click Here to see the picture in higher resolution. Cool cover! Great job, Lindy! I loved the old cover, but this one probably catches the tone of the book better. Hopefully it’ll garner the attention the book deserves. I love the new cover – You’re right – that’s a much better fit for the genre. You’re right, John – it’s stunning. Absolutely brilliant. Well done Lindy! Thanks David, couldn’t agree more.